This update to patch 23 fixes some bugs, adds a paid name change item and updates the emote system, including a new customizable emote wheel and three new emotes. These patch notes have been updated. Read the changes at the bottom of this post. This update to patch 23 fixes some bugs, adds a paid name change option, introduces a new customizable emote wheel with 3 new emotes available for purchase with BP and more. For technical testing purposes during this test server period, players will receive a name change item through the Player Care Package upon login. This item is only available on the test server and will be distributed until Nov 20, 6pm PST / Nov 21, 3am CET / Nov 21, 11am KST. Replay version has been updated, replays from previous updates are no longer playable. The voice chat is available in the custom match before game starts. Improved the in-game emote system. Added an ‘Emote’ tab in the ‘Customize’ menu. You can add/remove emotes you own to the Emote menu for use in game. You can also see animations of the emotes you’ve selected on the character to the right of the screen. You can have up to 12 emotes active at a time. Improved item visibility when you equip items on the Appearance menu. When you select an item in the Appearance tab, equipped items will now be hidden from the character in order to show the selected item clearly. Added the current region status in-game under the HP HUD. A paid nickname change item has been added to the store. The standard price is $9.99. This item will be $4.99 (50% off) from November 21 to December 5. 2018 PKL Items (Limited 3 items) are available. You can purchase various emotes from the store using BP. Improved the 3D character render to be more smooth when previewing skins or gear. Fixed an issue where pressing ESC while leaning would maintain the leaning stance. Fixed an issue in the custom game that in-game team list doesn’t match while switching over spectating teams with Page Up/Down keys. These hotfixes have been applied to the live server. Fixed an issue where the voice channel shown was not the active one. 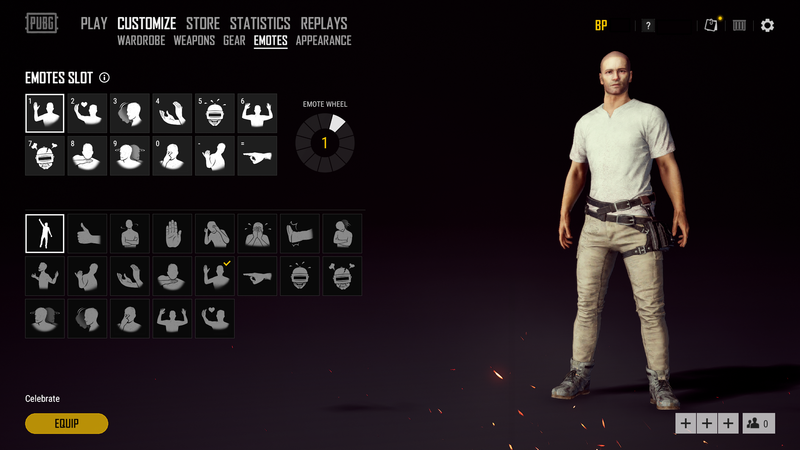 Fixed an issue where character model was shown as the opposite gender in the store preview screen. Fixed an issue causing a game crash when other players pick up an item while you are picking up same item with specific amounts. Fixed an issue that “You can’t report yourself” message comes up when you report a player from a Replay. Fixed an issue in the custom game that the voice chat doesn’t work in the airplane after setting the voice channel as ‘All’ in the voice option. Nickname change item is on sale for 50% off. This crate is now available in the live server. Added Ryan the Lion Crate. These are applied to the test server. Fixed an issue where vehicle horns continued to sound after exiting a vehicle while holding LMB. Fixed an issue with the Pan of Judgement skin preventing players from being able to completely remove the skin from their pan in-game. Fixed an issue where the lobby screen had black bars with certain aspect ratios. Fixed an issue which could cause the current server region indicator to be shown as “Unknown” beneath the health bar.